Thematic Table of Contents. Contributors. A Guide to Using the Encyclopedia. Michael Crichton, Foreword. Preface. Dedication. K. Padian and J.R. Hutchinson, Allosauroidea. L. Dingus, American Museum of Natural History. J.R. Hutchinson and K. Padain, Arctometatarsalia. H. Osmólska, Barun Goyot Formation. J.L. Sanz, Bastus Nesting Site. The Editors, Bavarian State Collection for Paleontology and Historical Geology. A. Chinsamy, Bernard Price Institute for Paleontological Research. B. Breithaupt, Bone Cabin Quarry. K. Padain and J.R. Hutchinson, Bullatosauria. J.S. Moratalla and J.L. Sanz, Cameros Basin Megatracksite. J.S. McIntosh, Carnegie Museum of Natural History. J.R. Hutchinson and K. Padian, Carnosauria. J. Kirkland, Cedar Mountain Formation. M. Norell, Central Asiatic Expeditions. T. Rowe, R. Tykoski, and J.R. Hutchinson, Ceratosauria. H. Bocherens, Chemical Composition of Dinosaur Fossils. J.B. Smith, Cleveland-Lloyd Dinosaur Quarry. J.R. Hutchinson and K. Padian, Coelurosauria. M.J. Ryan and A.P. Russell, Color. R.E. Chapman and D.B. Weishampel, Computers and Related Technology. J. Wright, Connecticut River Valley. L.M. Witmer, Craniofacial Air Sinus Systems. E-B. Koppelhus, Cretaceous Period. W.A.S. Sarjeant, Crystal Palace Dinosaurs. B. Britt and K.L. Stadtman, Dalton Wells Quarry. K. Carpenter, Denver Museum of Natural History. C. Coy, Devil's Coulee Dinosaur Egg Historic Site. M.J. Ryan and M.K. Vickaryous, Diet. D. Chure, Dinosaur National Monument. C. Coy, Dinosaur Provincial Park. P. Dodson, Distribution and Diversity. P.A. Murry and R.A. Long, Dockum Group. B. Britt and B.I. Curtice, Dry Mesa Quarry. K.E. Mikhailov, Eggs, Eggshells, and Nests. P. Currie, Erenhot Dinosaur Museum. M. Lockley, Footprints and Trackways. Per Christiansen, Forelimbs and Hands. J.I. Kirkland, Fruita Paleontological Area. K. Padian, Glen Canyon Group. D.A. Winkler, Glen Rose, Texas. D.J. Varricchio, Growth and Embryology. K.R. Johnson, Hell Creek Flora. D.F. Lofgren, Hell Creek Formation. J.A. Long and K.J. McNamara, Heterochrony. Per Christiansen, Hind Limbs and Feet. R.E.H. Reid, Histology of Bones and Teeth. W.A.S. Sarjeant, History of Dinosaur Discoveries: Early Discoveries. B. Breithaupt, History of Dinosaur Discoveries: First Golden Period. E. Buffetaut, History of Dinosaur Discoveries: Quiet Times. L. Psihoyos, History of Dinosaur Discoveries: Research Today. The Editors, Institute de Paléontologie, Muséum National d'Histoire Naturelle, Paris, France. D. Zhiming, Institute of Vertebrate Paleontology and Paleoanthropology, Beijing, China. Y. Azuma and Y. Tamida, Japanese Dinosaurs. D.A. Eberth, Judith River Wedge. D. Lessem and M. Schweitzer, Jurassic Park. B.P. Pérez-Moreno and J.L. Sanz, Las Hoyas. V.L. Santucci, Legislation Protecting Dinosaur Fossils. E. Frey and J. Martin, Long Necks of Sauropods. M.J. Ryan, Middle Asian Dinosaurs. J. Le Loeuff, Musée des Dinosaures, Espèraza, Aude, France. The Editors, Museum of Comparative Zoology, Harvard University. D.K. Smith, Museum of Earth Science, Brigham Young University. M. Schweitzer, Museum of the Rockies. D. Chure, Museums and Displays. A. Chinsamy, National Museum, Bloemfontein, South Africa. P. Davis, Natual History Museum, London. K. Padian, Origin of Dinosaurs. L.B. Tatarinov, Orlov Museum of Paleontology. M.K. Vickaryous and M.J. Ryan, Ornamentation. P.J. Currie, Paleontogical Museum, Ulaan Baatar. D.H. Tanke and B.M. Rothschild, Paleopathology. D. Rasskin-Gutman, Pelvis, Comparative Anatomy. K. Padian, Phylogeny of Dinosaurs. B. Tiffney, Plants and Dinosaurs. T.H. Rich, R.A. Gangloff, and W.R. Hammer, Polar Dinosaurs. H. Osmólska, Polish-Mongolian Paleontological Expeditions. D.F. Glut, Popular Culture, Literature. P. Makovicky, Postcranial Axial Skeleton. R.E. Molnar, Problems with the Fossil Record. S.J. Czerkas, Reconstruction and Restoration. G.S. Paul, Reproductive Behavior and Rates. J. Wright, Rocky Hill Dinosaur Park. H-D. Sues, Royal Ontario Museum. B.G. Naylor, Royal Tyrrell Museum of Palaeontology. P. Currie, Sino-Canadian Dinosaur Project. R.M. Alexander, Size and Scaling. The Editors, Skull, Comparative Anatomy. A. Chinsamy, South African Museum. F.E. Novas, South American Dinosaurs. E. Buffetaut, Southeast Asian Dinosaurs. C. Coy, Soviet-Mongolian Paleontological Expeditions. A. Milner, Spinosauridae and Baryonychidae. The Editors, State Museum for Natural History, Stuttgart, Germany. X-C. Wu and A.P. Russell, Systematics. P.M. Sander, Teeth and Jaws. J.R. Hutchinson and K. Padian, Tetanurae. G.M. Erickson, Tooth Replacement Patterns. W.L. Abler, Tooth Serrations in Carnivorous Dinosaurs. A.R. Fiorillo and D.B. Weishampel, Tooth Wear. R.R. Rogers, Two Medicine Formation. The Editors, University of California Museum of Paleontology. S.D. Sampson and M.J. Ryan, Variation. G.M. Erickson, Von Ebner Incremental Growth Lines. J.R. Horner, Willow Creek Anticline. M.A. Turner, Yale Peabody Museum. D. Zhiming, Zigong Museum.\ Resources. Index. Philip Currie is noted for many expeditions to sites in North and South America and Asia, particularly in China where he and others unearthed the "feathered" dinosaurs. He is currently the Curator of Dinosaurs at the Royal Tyrrell Museum of Palaeontology in Drumheller, Alberta, Canada, and an adjunct professor at the University of Calgary. He holds a doctorate from McGill University and is the author or co-author of nine earlier books on dinosaurs, as well more than 100 papers and articles. His work has been reported on by The New York Times, National Geographic, the PBS Nova series, Canadian Geographic, a CBS special on dinosaurs, and various other media. Kevin Padian is Professor of Integrative Biology and Curator of Lower Vertebrates in the Museum of Paleontology, University of California, Berkeley. His doctorate is from Yale University. He is a frequently quoted authority in both the scientific and popular press on the subject of dinosaurs, particularly on the relationship of birds and dinosaurs. His previous publications include seven books as well as 60 technical papers and 60 general articles, and his research findings have been described in Time, National Geographic, The New York Times, Discover, Scientific American, and other media. 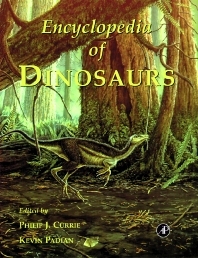 "The Encyclopedia of Dinosaurs is quite possibly the most valuable and comprehensive volume ever published on dinosaurs, and it is sure to become the reference work in the field. Edited by two of the world's foremost dinosaur experts, it includes hundreds of contributions from virtually every luminary in the field. The Encyclopedia not only embraces the very latest research, but it also includes copious entries on fossil sites, geological periods and formations, dinosaur discoveries, collections, paleontologists, methodology, and much, much more--all profusely illustrated. No topic in science generates more interest than dinosaurs, and this volume is an absolutely essential addition to any public library, educational institution, or museum. I can't imagine anyone with an interest in dinosaurs--laymen, student, or scientist--not wanting to own this magnificent book." --DOUGLAS PRESTON, Author of Dinosaurs in the Attic and Relic. "Here's the 'Who's Who' and 'What's What' about dinosaurs that we've been waiting for. An easy-to-get-around-in definitive compilation of general information about fossils, the theory, the scientists, the history--just about everything you'd like to know about--written by the finest scholars in the field. On top of the superb (and heavily cross-referenced) text, the Encyclopedia of Dinosaurs is wonderfully and profusely illustrated. I know I'm going to get a lot of use out of this book, and so would any teacher or parent with a dinosaur-nutty kid. (I think that's all of us....)"